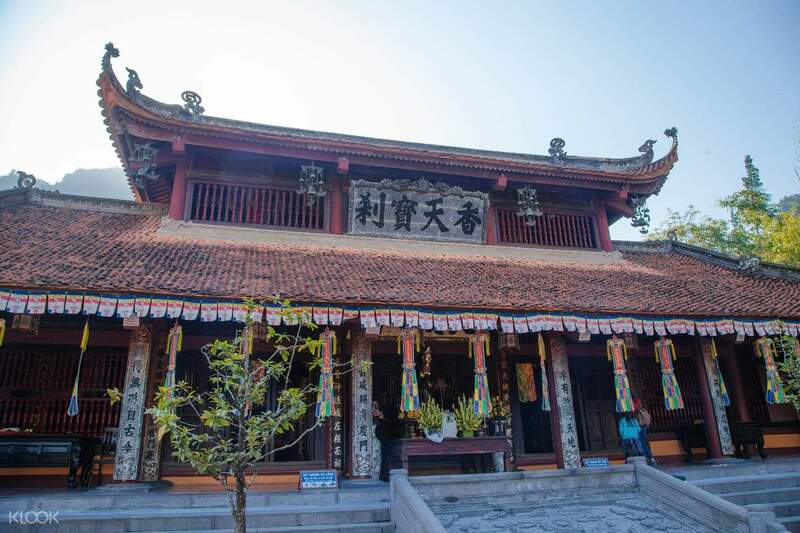 Make your way to one of Vietnam's most significant Buddhist sites on a guided day trip from Hanoi. 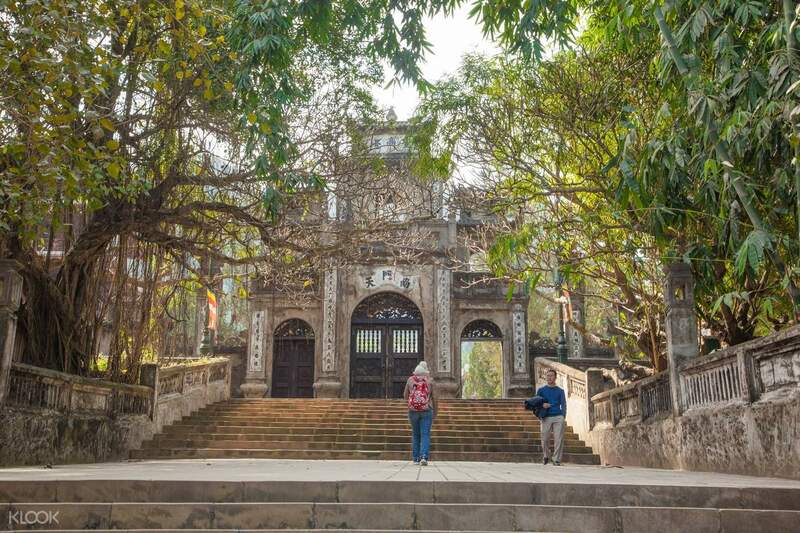 Start your morning with a convenient pick up at your hotel located within the Old Quarters, or meet up with your guide at the designated point before you're whisked off to the Huong Son District, where you'll officially begin the day's activities. Board a row boat and take a relaxing ride along the Yen Stream, where you'll pass scenic landscapes and enjoy the natural poetic beauty of the surroundings. 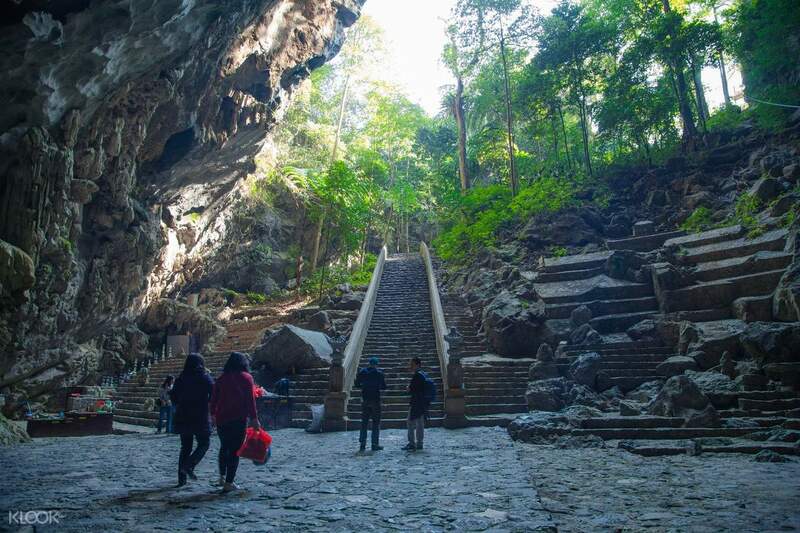 You'll then arrive at the Thien Tru Harbor, where you'll begin your trek up to the Huong Tich cave and finally arrive at the famed Perfume Pagoda, one of the largest and most unique religious sites in Northern Vietnam. The area is comprised of a complex of pagodas where huge numbers of pilgrims flock to to pray for happiness and prosperity in the coming year. Take in the intricate and natural designs within the caves and snap a few photos to take home before heading back to enjoy a delicious local lunch. As the sun sets, you'll be transported safely back to your hotel. Amazed by the women rowing the boat. So strong women. We tried walking up to Perfume Pagoda. Quite tiring but we are proud of ourselves that we reached the top. Perfume Pagoda inside the cave was a great citing. We go done by the cable car. Thank you Klook for thr great experience. Amazed by the women rowing the boat. So strong women. We tried walking up to Perfume Pagoda. Quite tiring but we are proud of ourselves that we reached the top. Perfume Pagoda inside the cave was a great citing. We go done by the cable car. Thank you Klook for thr great experience. The tour was awesome! We went with APT tour company. The tour guide Theng was fluent in english and was very informative! The 726steps to the pagoda is no joke! The steps are not even and the road all the way is rocky as well, so prepare yourself! I went during non peak season,so it was nice as it was not crowded. Apparently on peak season(feb-apr),it can hit up to 60k visitors per day! So plan your trip wel! No regrets taking this tour! Awesome stuff! Thank you APT tour and Klook! The tour was awesome! We went with APT tour company. The tour guide Theng was fluent in english and was very informative! The 726steps to the pagoda is no joke! The steps are not even and the road all the way is rocky as well, so prepare yourself! I went during non peak season,so it was nice as it was not crowded. Apparently on peak season(feb-apr),it can hit up to 60k visitors per day! So plan your trip wel! No regrets taking this tour! Awesome stuff! Thank you APT tour and Klook! Fun and informative tour! The tour bus/car picked all the passengers one by one for every hotel/hostel and the tour guide did their 30 minute spiel. We were also given one bottle of water each. After this, we had a boat ride to a pagoda, and then we had lunch. After this, they asked us if we wanted to ride the cable car. I bought the two-way ticket for VND 160,000 because it was very hot but some people in our group only bought one way. They arrived just a few minutes after we did on the way down so it's not that much of a hike. We then went into the cave and explored for a bit before going back to the restaurant and back to the bus on the rowboat. Hero was an excellent tour guide! Very funny and kind. Fun and informative tour! The tour bus/car picked all the passengers one by one for every hotel/hostel and the tour guide did their 30 minute spiel. We were also given one bottle of water each. After this, we had a boat ride to a pagoda, and then we had lunch. After this, they asked us if we wanted to ride the cable car. I bought the two-way ticket for VND 160,000 because it was very hot but some people in our group only bought one way. They arrived just a few minutes after we did on the way down so it's not that much of a hike. We then went into the cave and explored for a bit before going back to the restaurant and back to the bus on the rowboat. Hero was an excellent tour guide! Very funny and kind. This is the kind if tour if you want to see more Vietnamese religion culture, it was a bit more expensive than other tour as the cable car is not included that cost 180k dong each. Over all I can say the tour was just okay not much things to see compare from the other tour from hanoi. This is the kind if tour if you want to see more Vietnamese religion culture, it was a bit more expensive than other tour as the cable car is not included that cost 180k dong each. Over all I can say the tour was just okay not much things to see compare from the other tour from hanoi. It was a very good trip! Tour guide was very friendly and accommodating. It was a very good trip! Tour guide was very friendly and accommodating. - Harmonious view of mountains, river and pagoda - Delicate and kind tour guide - Not a bad quality of meal - Generally very peaceful tour. - Harmonious view of mountains, river and pagoda - Delicate and kind tour guide - Not a bad quality of meal - Generally very peaceful tour. After Ha long Bay and Trang An tour, this pales in comparison. They were 9 of us in the tour. Basically, some boat rides, temple tour and a cave tour. The Cave was the highlight, but our tour guide who is an obnoxious kid named Kiem, kept rushing us, only to rest for like 10 mins. You have pay for the tram which I would rate a lil higher if it was included. The tram takes 10 mins, but they say the hike will take 30-40 mins, which I cannot fathom how it would be possible to be on time if you go that route. But for us, we like to take a lot of pictures. The lunch is shared per table. This is a fairly ok tour, not good but not bad. There were a lot of construction going on. You buy some animals to set them free only for them to get caught. They picked us up on time and we were back in our hotel at a little over 6pm without a stop over at the end. 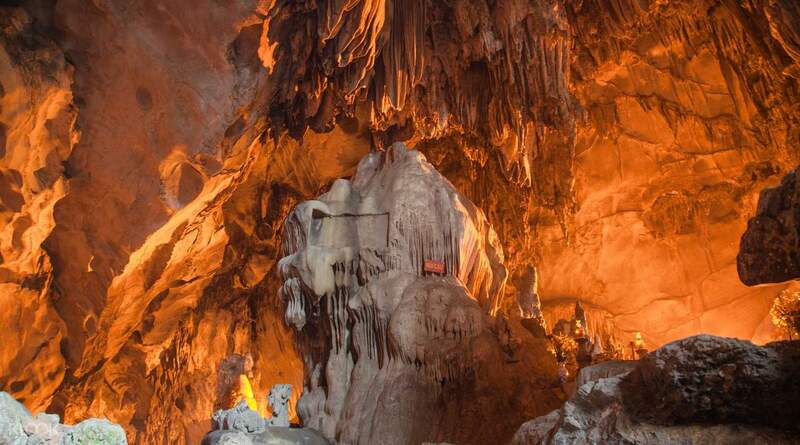 After Ha long Bay and Trang An tour, this pales in comparison. They were 9 of us in the tour. Basically, some boat rides, temple tour and a cave tour. The Cave was the highlight, but our tour guide who is an obnoxious kid named Kiem, kept rushing us, only to rest for like 10 mins. You have pay for the tram which I would rate a lil higher if it was included. The tram takes 10 mins, but they say the hike will take 30-40 mins, which I cannot fathom how it would be possible to be on time if you go that route. But for us, we like to take a lot of pictures. The lunch is shared per table. This is a fairly ok tour, not good but not bad. There were a lot of construction going on. You buy some animals to set them free only for them to get caught. They picked us up on time and we were back in our hotel at a little over 6pm without a stop over at the end. Good service and good tour to a very beautiful place. This place is still under renovation and expansion. I believe in 2-3 years time. It would be a must visit spot since the unique way to get into this temple is by boat. The only way. The boat is included but not the cable car. You can have the option to hike it which will takes way longer to arrive. Pros: 1) Good service and explanation by the tour guide Cons: 1) I would give a 5 stars if they include cable car fee in the package. I have seen many trip in Hanoi that provide much cheaper trip than this. 2) Not really a con but at least it is a good heads up for you who is going to travel here. The boat ride is not really enjoying because the seating is very uncomfortable especially you will need to sit for 1 hour back and fro. Good service and good tour to a very beautiful place. This place is still under renovation and expansion. I believe in 2-3 years time. It would be a must visit spot since the unique way to get into this temple is by boat. The only way. The boat is included but not the cable car. You can have the option to hike it which will takes way longer to arrive. Pros: 1) Good service and explanation by the tour guide Cons: 1) I would give a 5 stars if they include cable car fee in the package. I have seen many trip in Hanoi that provide much cheaper trip than this. 2) Not really a con but at least it is a good heads up for you who is going to travel here. The boat ride is not really enjoying because the seating is very uncomfortable especially you will need to sit for 1 hour back and fro. We went there on a very hot day, at first we rented a boat without the umbrella so we asked our guide if we can rent a boat which has a cover over our heads which is possible for paying an extra 200k vnd roundtrip for the whole boat. The cable car is 160k vnd roundtrip. The food is ok. The drinks are not included so you have to pay for it. Softdrinks costs 20k vnd. We went there on a very hot day, at first we rented a boat without the umbrella so we asked our guide if we can rent a boat which has a cover over our heads which is possible for paying an extra 200k vnd roundtrip for the whole boat. The cable car is 160k vnd roundtrip. The food is ok. The drinks are not included so you have to pay for it. Softdrinks costs 20k vnd.